Emeryville Sport Fishing had seven boats out Saturday, six chasing salmon and one rockfishing .On their salmon trolling trips, the Huck Finn, Sundance and Wet Spot were trolling and reported a combined 44 salmon to 25 pounds for 38 anglers while the New Salmon Queen and New Seeker were mooching for a combined 18 salmon to 23 pounds for 44 anglers. Captain Roger Thomas of the Salty Lady put in 10 salmon to 20 pounds for 20 anglers on Saturday. Captain Chris Smith of the Captain Hook went south of the Golden Gate on Sunday to pick rocks for limits of rockfish and a ling cod before pulling off for the opportunity to locate a few salmon. They ended up with three salmon to 18 pounds with Dan “The Barnacle” Wulff of Manteca getting an 18-pounder. Smith is running an open load combination trip Thursday. Warm water conditions throughout the Delta are contributing to the rapid movement of salmon through the river system. The counts outside the Golden Gate and in the upper Sacramento River above Hamilton City remain high, and although the salmon have to traverse the Delta to get into the upper river, the counts in Suisun Bay and below the Freeport Bridge remain less than expected. Striped bass fishing has been best above Rio Vista in the Liberty and Prospect Island region with large swimbaits in the shallows. Downstream a few miles, Viera’s Resort west of Isleton reported a slight improvement in the past week with more bright salmon brought in for photographs. For striped bass, blood worms and pile worms are scarce due to weather issues on the East Coast while bullheads remain a hot commodity due to a minimal supply. The central Delta remained slow for striped bass, and Mark Delnero of Fin Addict Sport Fishing out of Pittsburg said, “The wind was up on Sunday, and we had to hide in Spoonbill Slough to land three legal stripers to 23 inches on shad, as the main Sacramento was whitecapping.” In the Stockton area, Brandon Gallegos of H and R Bait reported fresh shad remains a viable commodity with deliveries of 30-35 pounds arriving Wednesday, Friday and Saturday. Striper fishing has been best in the Tracy area off of Grimes Road with a 33-incher landed on fresh shad this week. Gallegos put in a limit at 27 and 24 inches on shad in the main San Joaquin River near Buckley Cove. Bait-sized bluegill have been harder to locate, but the larger panfish are showing up. Eight Mile Road west of Stockton remained a top location for bluegill from the shoreline. The kokanee and king salmon plants by the Department of Fish and Wildlife have been released, and Don Pedro will receive only 9,991 kokanee salmon while being loaded with 90,035 king salmon. Kokanee action was inconsistent throughout the season, and this trend continued as the remaining kokanee are preparing to spawn. Trout are providing the best action with spoons, as the fish are keying on the threadfin shad schools. King salmon are holding in deep water but are reluctant to bite rolled shad or lures at the present time. With the lowered pool of water, the salmon action should be strong during the fall months. The Fleming Meadows ramp is limited to one lane, but there is plenty of deep water in which to launch a boat. For bass, live bait of minnows or night crawlers under a bobber continued to be the most productive technique. There are some quality fish taken on top-water lures such as Pop R’s or the River2Sea Whopper Plopper in white or shad patterns working in the early mornings or evenings. During the daytime, the action slows, but drop-shotting with shad-imitation plastics at depths of 30-50 feet should produce a few fish. There is a new 5-mph speed limit from the ramp at Blue Oaks Recreation Area to the Buoy Line at the mouth of Fleming Bay. The launch ramp at Fleming Bay is limited to one lane at the present time. The lake is currently at 700.50 feet in elevation and 40 percent of capacity. Call: Monte Smith, (209) 581-4734; Danny Layne-Fish’n Dan, (209) 586-2383; Gary Vella, (209) 652-7550; Bait Barn, (209) 874-3011. The lake continues to release water at a high rate, but the Barrett’s Cove South Launch Ramp will remain open for at least two weeks and perhaps the next 20 days or so. The marinas have closed and moved out to the deeper portions of the lake. Despite the low water conditions, Diana Mello of A-1 Bait in Snelling reported bass to 12 pounds have been landed on spinnerbaits with another two eight-pounders caught and released. The Barrett’s Cove North Launch Ramp is open, and construction is taking place to allow for a turnaround closer to the lake so vehicles will not have to back down the entire length of the steep ramp. This ramp has not been exposed for decades. Kayakers and canoe paddlers are accessing the lake from the shoreline to take advantage of the solid bass fishing on live minnows or crawdads. The live bait is also working for large catfish from the banks. In response to the drought, A-1 Bait is selling all plastic worms at 30 percent off. Trout, king salmon and kokanee reports have been elusive. McClure will be receiving 49,197 king salmon and 20,012 kokanee fingerlings from the Department of Fish and Wildlife. The lake dropped 5.5 feet to 646.66 feet in elevation and 14 percent of capacity. A-1 and the Bait Barn are stocked with all sizes of minnows. A 51/2-mile stretch of the Merced River in Snelling is now closed to fishing due to low water conditions. Call: A-1 Bait, (209) 563-6505; Bub Tosh, (209) 404-0053. Diana Mello of A-1 Bait said king salmon to three pounds have been reported in McSwain by trollers working the deeper portions of the lake at 30 feet in depth. The heavy water releases from Lake McClure account for the kings moving through the dam into downstream McSwain. Rainbow trout provide the best action, and the Lake McSwain Marina reported trollers have the upper hand at the present time with chrome/blue Kastmasters or gold Wedding Rings from the marina up the river arm toward the dam. The lake levels remain steady at the normal elevation due to regular releases of cold water from McClure. The lake was planted at the end of August, and another trout plant is expected this week. Bank fishing has been slow over the past week. The first Fall Fest will occur at the lake Saturday with wakeboarding and hot boat exhibitions throughout the day. The annual Merced Irrigation District Trout Derby will occur Oct. 4-5. Call: McSwain Marina, (209) 378-2534. Bass fishing remained solid with good numbers of small spotted bass taken on 4-inch plastic worms on the drop shot or dart head in the shallows. The bass are chasing shad, and anglers are at the ready with a rip bait on an extra rod in the event of running into a boil. The better grade of fish is taken on rip baits or top-water lures with numbers taken off the bottom at depths to 30 feet on plastics on the drop shot or dart head or dragging a jig. Catfish to five pounds are biting anchovies or sardines in 40 feet of water above Finegold. No striped bass reports. The lake dropped 3.5 feet to 501.12 feet in elevation and 42 percent of capacity with a release of 1,459 acre-feet of water. All boats must fill out a Quagga mussel self-inspection form before launching. In the lower San Joaquin, heavy flows from the reservoir have limited interest with few anglers targeting the Broken Bridge. There are new regulations on the lower San Joaquin, and from Friant Dam downstream to the Highway 140 Bridge, only two hatchery trout or hatchery steelhead are allowed with a total of four hatchery trout or hatchery steelhead in possession. Call: Fresno Fisherman’s Warehouse, (559) 225-1838; Valley Rod & Gun, (559) 292-3474. New Melones hosted the FLW College Fishing Western Conference event Sunday, and the Fresno State Bass Fishing Team took the top three places with Jeremy Pitts of Visalia and Michael Cantu of Fresno taking top honors at 22 pounds, 3 ounces, including a huge largemouth in excess of 12 pounds. They were drop-shotting a 41/2-inch Roboworm Prism Shad or dragging a California Reservoir Lure’s jig in sculpin with the big fish coming on the jig. Pitts said, “We were fishing deeper than most teams, targeting long tapering points in 25 to 35 feet of water.” John Lietchy of Glory Hole Sporting Goods in Angels Camp reported, “The shad are schooling up in the deep water, and the bass are hunting them down in wolf packs. Trout fishermen are trolling in deep water and hooking spotted bass on shad-patterned spoons.” Vertically-jigged spoons are effective as well as shad-patterned plastics such as the Wright Bait WB101. Lietchy touted the California Reservoir Lure’s jigs as their selection of colors is specifically designed for Mother Lode lakes. Trout fishing remained slow, but the action is improving progressively as the water cools. There have been few trollers on the lake. A few rainbows are found at depths from 40 to 60 feet along the deeper portions of the lake with shad-patterned spoons such as Needlefish, ExCels, Vance’s Slim Fins or Speedy Shiners. The kokanee season has rapidly wound down, and few fishermen are targeting the landlocked salmon. A few dark kokanee are taken at 70-90-foot depths with large lures scented with various Pro Cure gels behind large flashers. The Department of Fish and Wildlife will release 50,640 fingerling kokanee into the lake for the coming year. The fish are losing their scales and turning into the spawning color pattern. Catfishing remains a solid option with frozen shad, mackerel, anchovies or sardines on a sliding sinker rig along muddy, sloping banks. Crappie fishing continued to be slow, and the best action remained under lights at night with live minnows or minijigs. The Tuttletown Launch Ramp is closed while the Glory Hole Point launch ramp is open on the volunteer ramp, but it is a long walk back to the parking lot. There will be some transition periods between launches when the ramp will be limited to one or two lanes. The lake is as low as it has been in recent memory with the water level receding 21/2 feet in the past week to 866.16 feet in elevation and 23 percent of capacity with a release of 491 acre-feet. Call: Glory Hole Sports, (209) 736-4333; Monte Smith, (209) 581-4734; Danny Layne-Fish’n Dan, (209) 586-2383; Sierra Sport Fishing, (209) 599-2023. Shore fishing remained fair in the main lake with pile worms or blood worms around Dinosaur Point for the occasional legal fish to 25 inches. 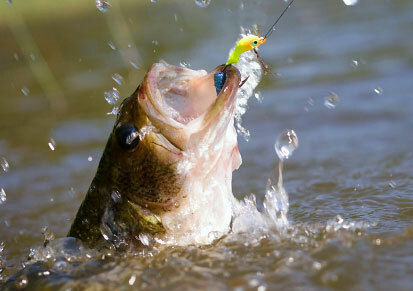 Fishermen will have to go through a number of sublegal fish before putting together a limit. Roger George of Roger’s Guide Service said the bite in the big lake seemed to really slow with the full moon. “Between a dead calm and the high winds that kick up quickly, it’s been hard to find and stay on the scattered fish,” he said. “The low level Basalt ramp is especially dangerous now in the north wind, since the rollers are coming up right behind your boat as you pull out.” In the Forebay, swimbaits, RatLTraps, ripbaits and white flukes on a Scrounger head are working for large numbers of undersized stripers. Boaters are moving out past the weed growth to work the lures. In the main lake, boaters are also drifting extra-large minnows at 40-60-foot depths near the Trash Racks for larger striped bass. The lake remained at 19 percent of capacity despite the importation of 2,355 acre-feet of Delta water. Call: Coyote Bait and Tackle, (408) 463-0711; Roger George of Rogergeorgeguideservice.com, (559) 905-2954.